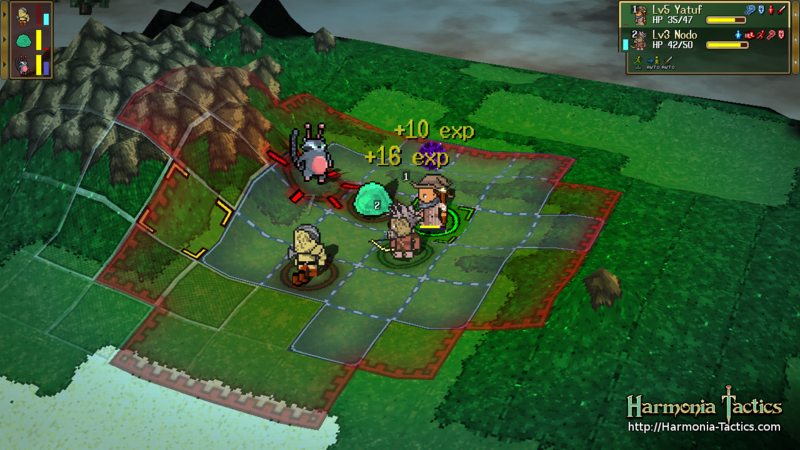 Harmonia Tactics aims to be a massively multiplayer adaptation of the turn-based tactical RPG with a sprinkling of RTS and a dash of Roguelike. Gameplay is no longer turn-based, but not quite realtime either. The mega-game also features a unique territory control mechanic in a procedurally-generated world that unites players against an ever-advancing dark force bent on conquering the kingdom of Harmonia. Create a party from eight basic character classes, each with unique strengths and weaknesses and an important role to play on the battlefield. Victory is only possible through superior positioning of units and clever use of class skills. 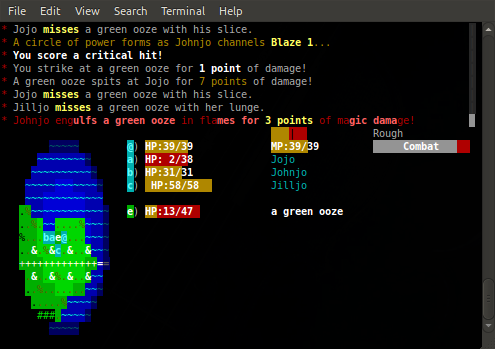 Outside of battle, players wander around in real-time using WASD and interact with one another, buy stuff, take quests, etc. When combat is initiated, a battlefield appears around the combatants and movement and actions within that area expend Stamina to execute. This has the effect of regulating the battle into a series of "turns" of 6-10 seconds each (depending on how fast your Stamina regenerates). Tower War: Two teams. Two towers. Only one victor! In this Red vs. Blue game, guide your team to victory using superior teamwork and strategy. As the enemy's forces dwindle, target their tower to win the round! This mode is running continuously on the harmonia-tactics.com server, so join in! Battle Arena: This is a demo of Harmonia's battle system, in the form of a 15-round arena. Defeat hordes of monsters, upgrade your team, and fight until your last breath! Can be played single player or co-op online (but you gotta host it yourself at the moment). Cheesetopia (WIP): Single-player horror/survival adventure set in a creepy abandoned compound with a suspiciously rodential theme. Solve the mystery of the unfortunate inhabitants' demise! Also marvel at the game engine's event/dialogue/storytelling mechanics. Here's a quick review for everyone. 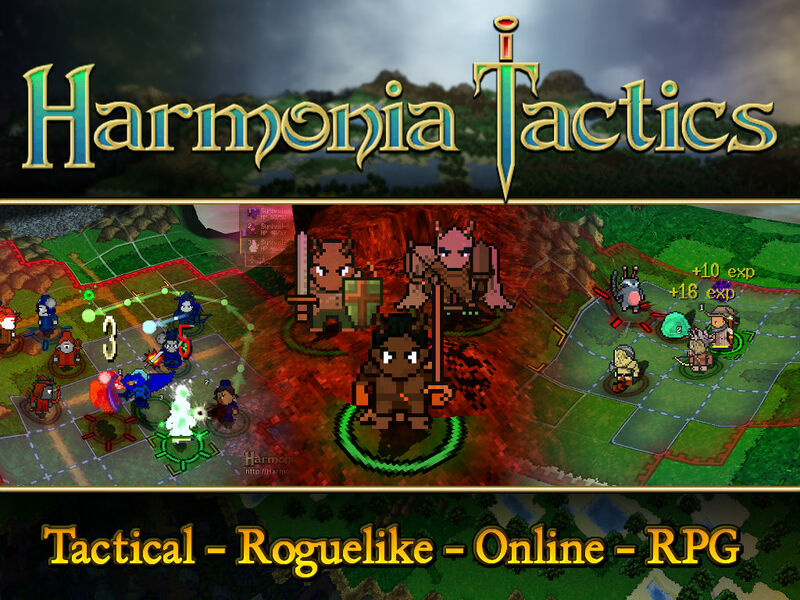 Harmonia Tactics is an online adaptation of the fantasy tactical RPG genre with added roguelike and territory-control mechanics. Through a series of tactical skirmishes, players work to protect the kingdom of Harmonia from the invading forces of a corruptive phenomenon known as The Dissonance. They assemble small teams of soldiers from eight basic character classes and attempt to liberate regions controlled by the enemy, while defending friendly regions against hostile advances. Watch out for ogretaurs, they are serious business! This project began its existence all the way back in 1995, as a single-player text adventure game written in QBasic. Over the years it developed into a standard command-line MUD, then into a quasi-graphical MUD with roguelike controls, then into multiplayer game with basic visuals, and finally into the 3D multi-character tactical RPG you see today. And we'd like to take it a step further, incorporating the aforementioned large-scale multiplayer campaign set in a complex procedurally-generated world engulfed in war. ShiningMUD, as it was called at the time, wasn't much to look at, but it was ours and the gameplay was awesome. 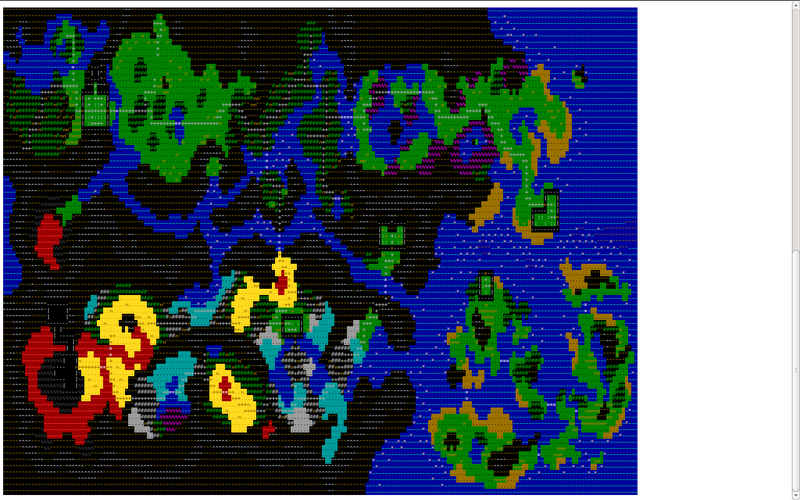 Look at that sweet 16-color world! We want to have more characters, bigger battles, more settings, music, encounters, castles, hamlets, quests, sub-quests, side-quests, mini-games, easter eggs, and more! We want to build this game into the full-fledged online adventure we dreamed about back in '95. That's where we need you, because these things cost time and energy and money, and we can't do it alone. We have a playable demo to show off the combat engine. And it's fun. We have some sweet backer rewards of both the in-game and the hanging-on-your-wall variety. If you don't want to back with money, back with publicity! We need that too! Check out this beautiful handmade screen print featuring the relationships between the different character classes of Harmonia Tactics. It's not only pretty, it shows you how to play the game! And it could be yours! Harmonia Tactics Demo v1.5.0b Release...d! Kickstarter Announce...d! Now focusing on the territory-control aspect of the game, the team is experimenting with different ways to visualize enemy presence on the world map. Harmonia Tactics Demo v1.4.3 finally released! We're finally done testing the distributable Linux version of the game. There's a Windows release too, but who cares? Harmonia Demo v1.0.0 - Battle Arena! Demo Version 1.4.3, now featuring greater compatibility, stability, and fun....ility. Hey, I was wondering about the name change? I have a link in my bookmarks from long ago to Harmonia-online.net as I wanted to keep an eye on it. It seems you have rebranded completely and are a bit less ambitious this time around. Could you tell me what prompted the name change and what differences are from the 'Harmonia Online' concept you originally promoted? Hey Evropi, glad to see you've been keeping an eye on us for such a long time! The name change is mostly to help search engines - a Google for "Harmonia" produces 28 million results, vs. 69k for "Harmonia Tactics". We dominate the search results now, plus we can use Harmonia-Tactics.com. Also, our original plan was to produce a lot of hand-crafted content; problem is, there's not much replay value after you've done it once, so we've shifted to a procedurally-generated model. That's what all the Kingdom generation stuff is about; the game will be different each time you log in to play, which should be pretty awesome. *Edit I went to your games website and downloaded the newest demo. Pretty cool I have to say. I only find myself wishes I can pause for a moment to issue commands...Everything happens so quickly. I love the graphismes ! Thanks :) There is no artist on the team yet, so everything has been my own mediocre art so far. But, the 3D engine is shaping up, so everything should look great once the sprites and tilesets get an overhaul. Interesting cncept, now tracking. Good luck! Aaand now I relearn how to post Soundcloud links. It's been a while.